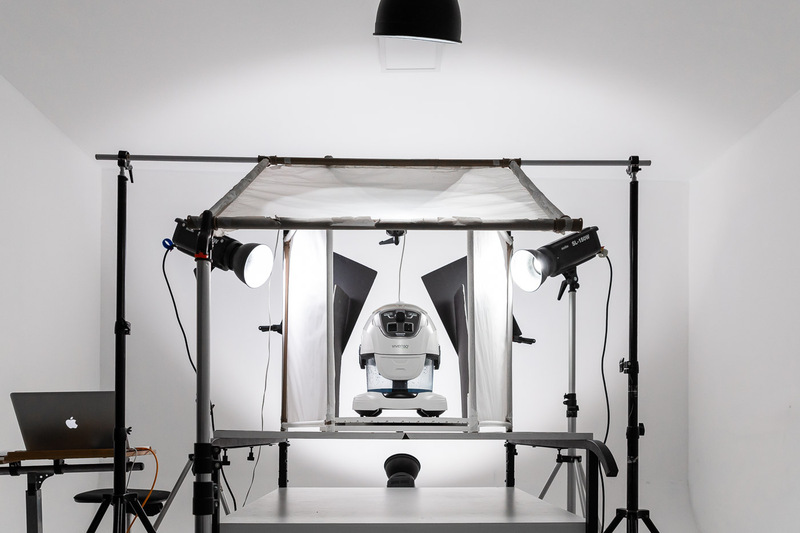 If you have been reading this blog or followed us on Facebook, you know that Amazon recently started showing 360 product photography in a few selected product listings (example). There's pretty much no information on the web about this new feature, so we quickly concluded that Amazon picked a few large retailers to test waters with the new technology. This appears to be the case! To learn more about the recent development with 360 product images on Amazon or even if you are just interested in related topics, listen to this awesome episode by Bobsled Marketing and Jeff Hunt at Snap 36. Don't have a spare 40 minutes for the podcast? There's a list of key takeaways on this page. Our takeaway is simply this... even though Snap 36 is currently a prime beneficiary of the developing trend, covering selected few listings on Amazon, we feel that in a short while this technology will be available to everybody. So whether your are a commercial photographer or an eCommerce vendor, there will be an opportunity (and a challenge!) for everybody. Have you heard that Amazon is testing waters with 360 product photos as we have recently spotted in a couple of product listings by Bosh and Ashley Furniture (example, example)? How about this recent announcement by Shopify? If you are still on the fence whether to implement 360 product views into your eCommerce strategy, consider this study by Tibert Verhagen, Charlotte Vonkeman, and Willemijn van Dolen that was published in Cyberpsychology, Behavior, and Social Networking, Vol 19, No 7. Almost four hundred undergraduate students participated in this study in Netherlands in 2016 where they rated various forms of perceived product tangibility and their purchase intentions using product pages on Ray-Ban.com. Ray-Ban offers all three presentation options for some of their glasses which is rare. This is mainly because "virtual mirror" is specific to fashion (we couldn't recall a successful commercial implementation that didn't involve eyeware) and the technology is still complex and finicky. 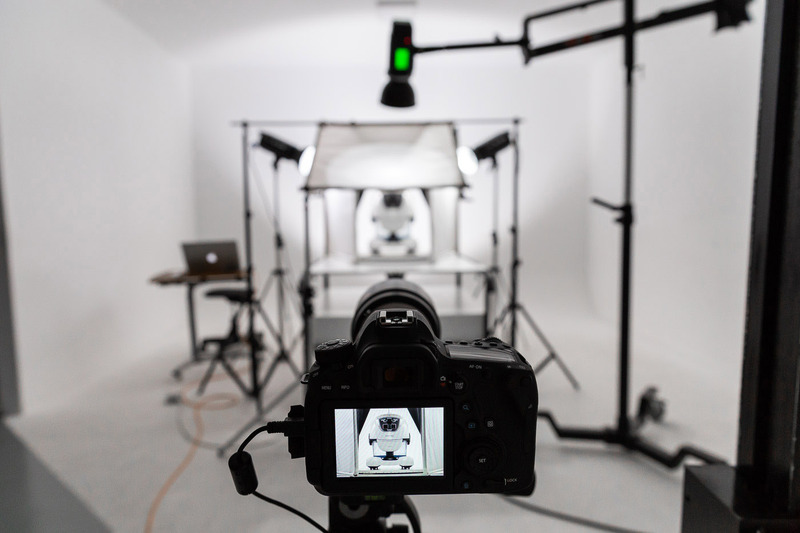 While we encourage you to browse through the entire paper, the results on page 3 is what we're after and they make perfect sense: virtual mirror is a winner followed by 360 product photography. 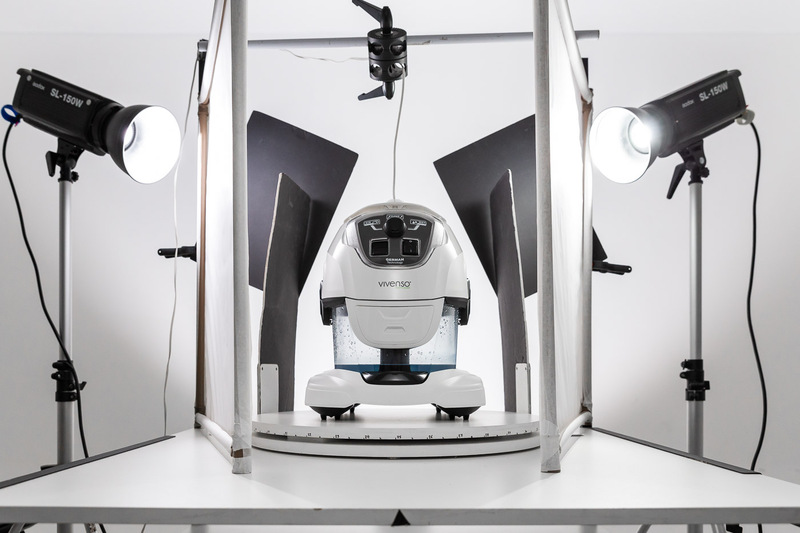 Interestingly, the difference between the virtual mirror and 360 product spins seems very close to the gap between the spins and still product photos. 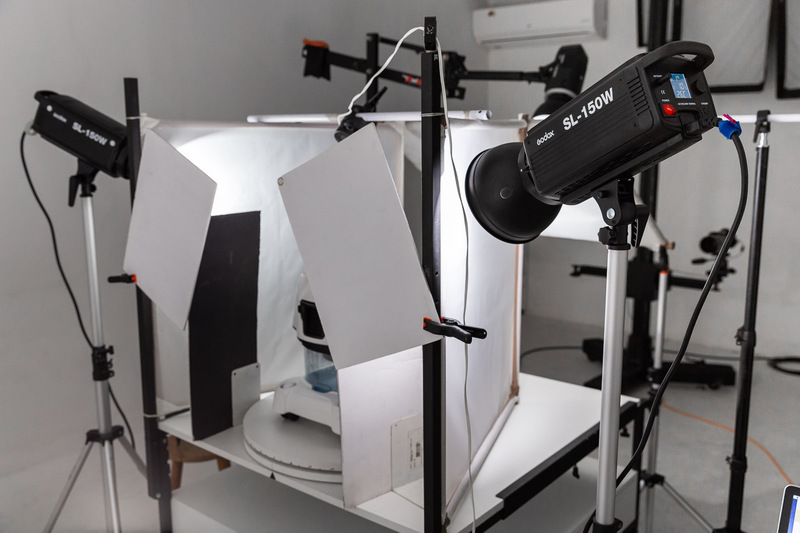 As a take away from this study consider this: buyers who interact with 360 product images are 14% more likely to purchase a product than when there are still photos alone. With "virtual mirror" there's an extra 15% improvement. And that's not all as we have to also consider that the improved experience ("perceived diagnosticity" which is 17% better with 360 product spins as per the study) can reduce product returns and improve the overall shopping satisfaction. Another interesting research by folks at University of Hong Kong and Stanford (published in the Journal of Consumer Research) looked into the affect of having multiple additional images of the same product on buyer's ability to compare and decide while shopping online. Surprisingly, participants who saw extra photos were "both less confident about their decision and liked and valued the product less than those who saw only one photo for each product". Considering the results from the first study, we think that some products such as shoes used in the last research can benefit from having a single 360 product view and forgo still images altogether. We often get these questions regarding the 360 product view of the Reebok shoe that you probably already saw on our home page. A lot of these questions are specific to the actual photography so this post we hope will answer some these questions and serve as a good reference for future inquires and updates. We have been approached by Reebok a while back to see how we could shoot their new line of sneakers. They sent us an example and so we quickly assembled a proof of concept using some of the rigging we had left from a recent SCUBAPRO photoshoot (a bunch of buoyancy compensators that required an elaborate rig with hooks, finishing lines and some manual spinning action..). This time we automated the setup by attaching our basic Ortery turntable upside down in hopes that we would improve upon this quick mock-up design later on and be able to shoot hundreds of similar items every now and then. This mock-up design is what you can see in the pictures below. The rig had two Mathews C-stands, a boom pole with a steel plate in the middle (by the same company) and a sheet of plywood that already had holes in it for the steel plate from the previous project. So the table was simply attached to the rig upside down with a sturdy wire. 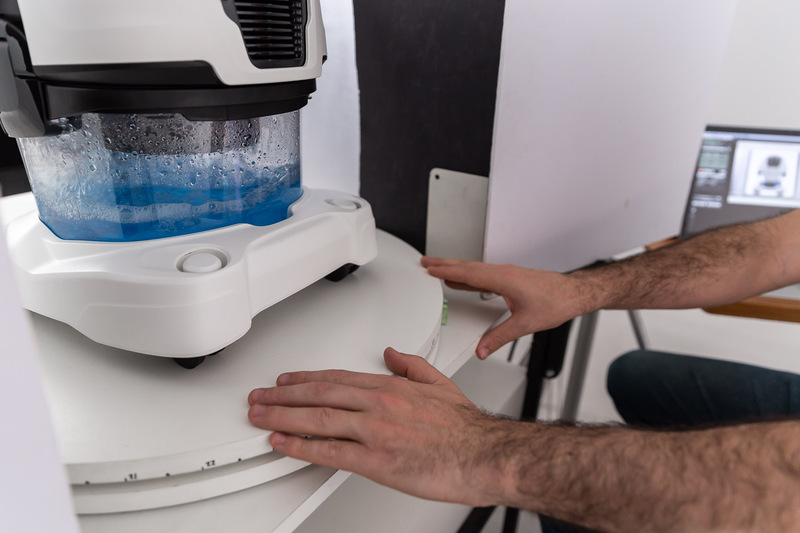 One great thing about the Ortery 360 product photography turntables is that you can re-use the center nut for various applications and so we used a bolt and some tough wire to add the missing pieces. The wire was made quite long to let the boom light to pass through so the shoe was evenly lit. 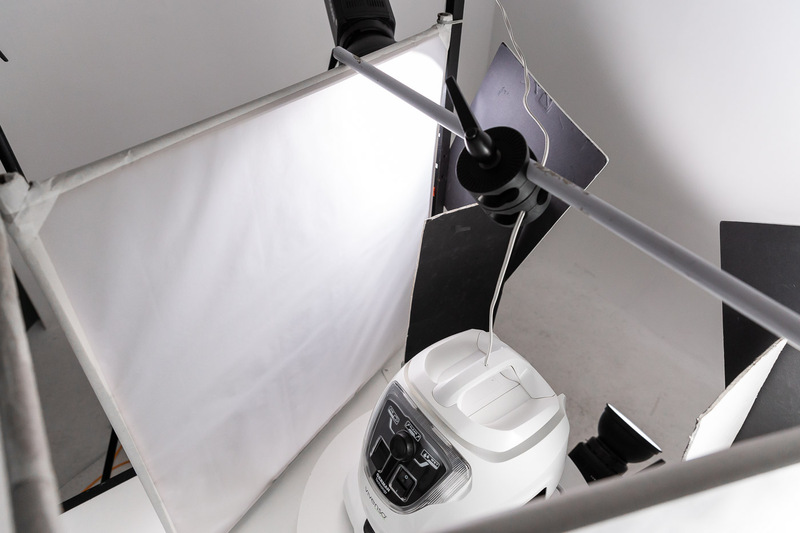 One of the Reebok requirements was to keep the reflection of the shoe on the final 360 product images which was accomplished by having a sheet of translucent plastic under the rig. 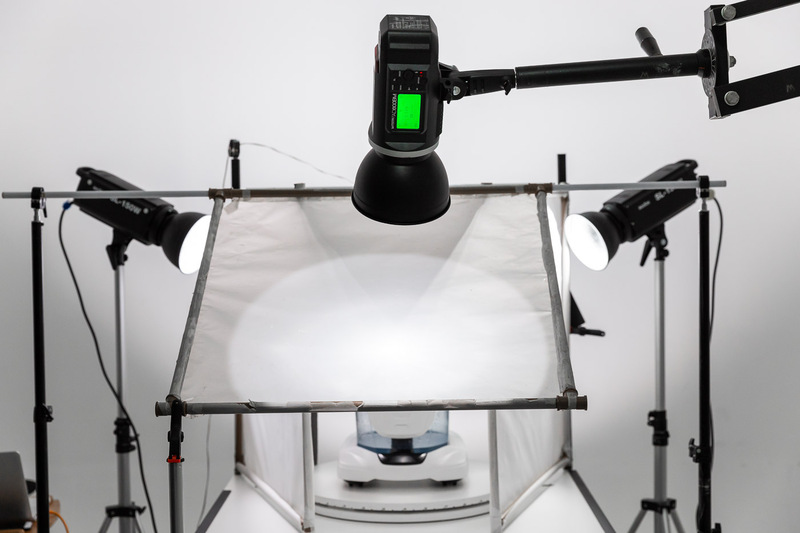 And while this is not really visible in the reference shots of the setup or in the final 360 product spin, the shoe doesn't touch the translucent sheet. We also made sure there's plenty of light in this area during photography to really highlight the sole of the shoe which had some nice design, color and branding. 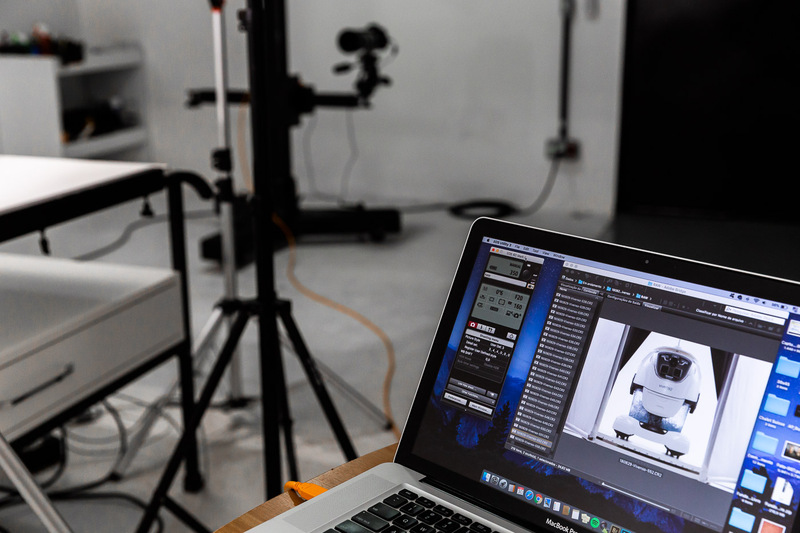 Post production was a whole new story and this time we had to solicit some outside help - there are companies that offer specialized product retouching services and their assistance can be invaluable. PS: since then we have seen this type of angled 360 degree shoe photography in various places online and realized that our approach with the wire could be improved. For example, it would have been better to shift the center of rotation closer to the middle of the sole and may be use some solid translucent plexiglass tube to help with the post work (i.e patching the wire was intense..). Another thing we should have tried is this approach with suspension which at that time we thought wouldn't allow for a rotation without a noticeable wobble. If you have done something like this that you would like to share on this blog or our Facebook page, please get in touch!